Register Log In AmbergrisCaye.com Home Forums Living in Belize Cost of Living up! 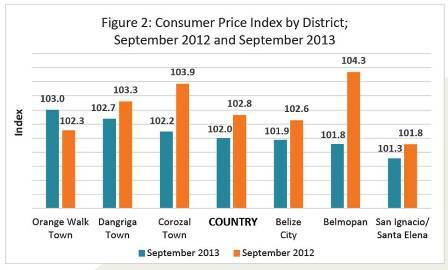 The Statistical Institute of Belize has issued the Consumer Price Index or CPI for September 2013. Not surprisingly, for consumers who have been feeling the pinch, the statistics show that prices crept up by zero point eight percent higher than last September. The cause is due to price increases in the categories of Transportation, Housing, Water, Electricity, Gas and Other Fuels as well as food. Food prices shot up by two point three percent, primarily in the price of beef rice and vegetables. But clothing and footwear declined by just under three percent. In respect of GDP Growth, the SIB says that in July through September, there was an expansion of zero point three percent of the economy. The low growth says the SIB during the three month period is due to the drain that agriculture and oil production continue to have on the economy. Banana production fell by six percent, but oil production fell to its lowest third-quarter level since 2009 and it appears that the trend will continue downwards. 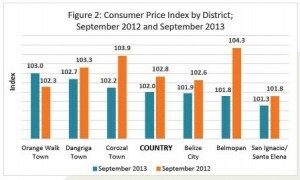 The cost of living in Belize has gone up 0.8 percent compared to last year this time, according to the latest Consumer Price Index of 102.8 for September, published by the Statistical Institute of Belize on Tuesday, December 17. That’s because the cost of most food staples have gone up. The possible exceptions are sugar, whole chicken and oranges, which have shown only minuscule reductions in price. Ground beef which used to be $4.14/lb is now $5.23, while a pound of steak that used to be $5.96 is now $6.86. Rice that was $1.39/lb is now $1.50, while flour that was $1.02 is now $1.14. Red kidney beans have gone from $1.77 to $2 per pound, while a dozen eggs is now $3.69, compared to $3.09 a year ago. A can of condensed milk has gone from $2.30 to $2.39 and a liter of milk has risen from $2.90 to $3.17. Local onions have gone from $1.69 to $1.90/lb, while sweet peppers are $4.24, up from $3.65 and carrots have gone up five cents per pound. A good part of this increase is the overall increase in the price of fuel. Premium gasoline has come done in price but regular gasoline and diesel, used by goods trucks and buses, have gone up; as has the price of cooking gas; from $108.55 to $115.30 for a 100lb cylinder. This filters down to price increases in transportation, housing, water, and electricity, food and non-alcoholic beverages. Fortunately prices fell on clothing and shoes, particularly women’s and children’s clothing. Insurance companies cut the cost of their premiums for both health insurance and vehicles, as consumer demand has been slow. Inflation fell to a mere 0.3 percent for the first nine months of 2013. The transportation index went up, mainly because of higher international airfares. Clothing and Footwear prices declined by just under 3 percent, reflecting lower prices for and footwear. Both health and motor vehicle insurance costs declined. The institute surveyed six municipalities and Belmopan showed the highest rate of inflation, up 2.5 percent, while San Ignacio was down 0.5 percent. Orange Walk Town also showed a decline in inflation rate down 0.7 percent.